The AEF has placed 2 HD video cams on the nest tree, and another cam mounted some distance away that gives a beautiful view of the nest tree. In past seasons, we have provided 3 separate viewing screens that can be viewed simultaneously. While there are benefits from being able to see all cams at once, there are downsides—both to the individual viewer and to operational expenses. 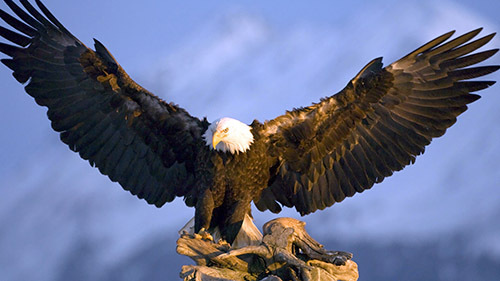 Our cameras and technology are constantly being upgraded, resulting in better images, but requiring more bandwidth. When 3 videos are being streamed at the same time on each viewer’s computer, the cost is astronomical for AEF because of the amount of bandwidth used. And, having 3 streaming video screens (or even 2) running simultaneously on an individual’s computer makes that computer “work harder” – sometimes resulting in stream interruption and having to refresh the browser to restart a stream. TABS ARE GONE, BUT WE STILL HAVE 3 VIEWS! Our new streaming partner, HDOnTap, provides thumbnails for “Other Views” — so, if you mouse over the cam, you will see all three cam views at the bottom of the screen. By default, Cam 1, or the first thumbnail, is streaming. If you want to see Cam 2, click on the 2nd thumbnail. 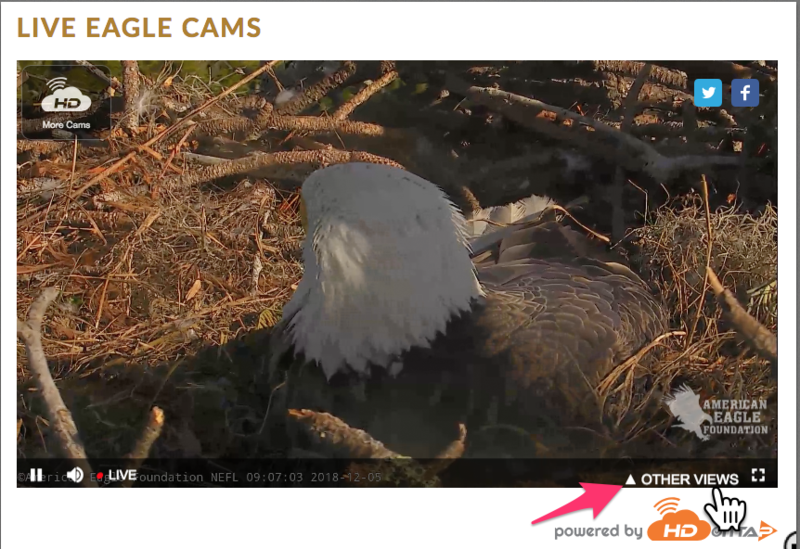 To see Cam 3 (the long-range tree view), click the third thumbnail. In the images below, note the “Other Views” at the lower right. You will see that if you mouse over the video screen. When you click “Other Views,” 3 thumbnails appear and you can select the one you want to see! To close the thumbnail view, click the “x” above the thumbnail strip. The good thing about chat is that it can be POPPED OUT. — moved around on your computer and placed anywhere you want it to be. You can also resize it! POPPING OUT THE CHAT WINDOW: Look at the bottom lower right icon underneath chat (it’s a square with an arrow pointing in a northeast direction outside the square.) By clicking that little square, a separate chat window opens that you can move anywhere on your computer screen. MOVE THE POPPED OUT CHAT WINDOW: Simply place your curser at the top of this new “popped out” window, hold down the left side of your mouse, and you can move the new chat window anywhere you want it to be. RESIZE THE CHAT WINDOW: You can also resize the chat window by placing your curser at the lower right edge of the “popped out” chat window. When a horizontal arrow appears, hold down the left side of your mouse, and drag that edge to make the window wider or taller. HDOnTap is still Beta Testing this feature. It is not yet available, but we hope to have it soon. 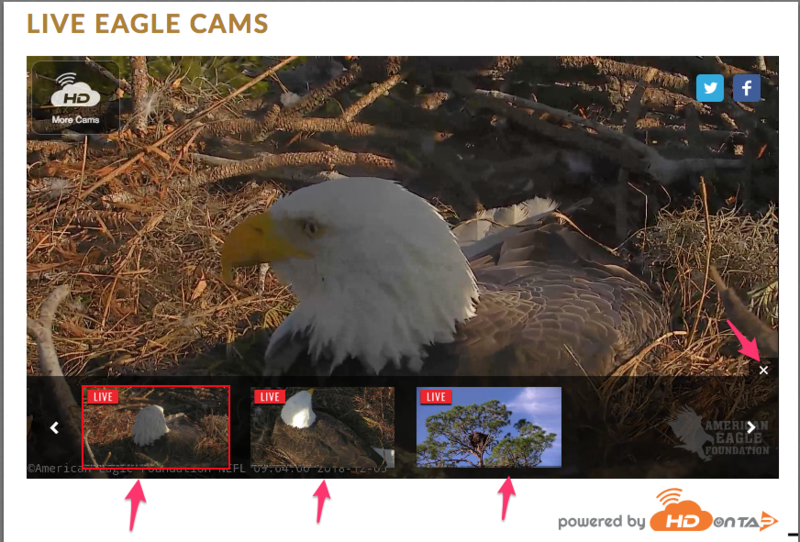 ADDITIONAL CAMS ON NEST TREE – WHAT ARE THEY FOR?